The concept of Big Data has been around for years with a majority of organizations understanding the true value of big data thereby increasing their efficiency and in taking better business decisions. Both large and small business organizations are using big data and related analysis approaches as a way to gain more information to better support their company and in serving their customers/clients and as such benefitting from the advantages of big data. Big Data can be best described through its four features or characteristics such as Volume, Variety, Velocity and Veracity popularly known as Four V’s of Big Data. The practical challenges of adopting big data on a large scale for enterprises across the globe includes funding and return on investment and skills. Failure to correctly address the big data challenges can result in escalating costs as well as reduced productivity and competitiveness. On the other hand, a sound big data strategy would help organizations in reducing costs and in gaining operational efficiencies by migrating to heavy existing workloads to big data technologies in addition to deploying new applications to capitalize on new opportunities. The big data’s prominence has grown in these five decades forming part of Business Operations to help employees to work more efficiently and in streamlining the collection and distribution of information technology. According to a survey conducted by getindata.com almost 60% of participants stressed that Big Data is a mission critical for their business. 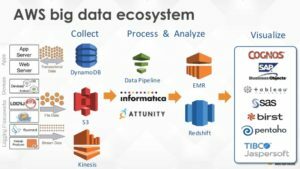 The emergence of cloud computing service providers such as Amazon Web Services has resulted in the growth of big data applications in a big way. Amazon Web Services was launched in 2002 and officially re-launched in 2006 with initial service offering of Amazon S3 cloud storage, SQS (Simple Queue Service) and EC2. Amazon Web Services delivers an integrated suite of services providing everything that is needed in quickly building and managing a data lake for analytics. 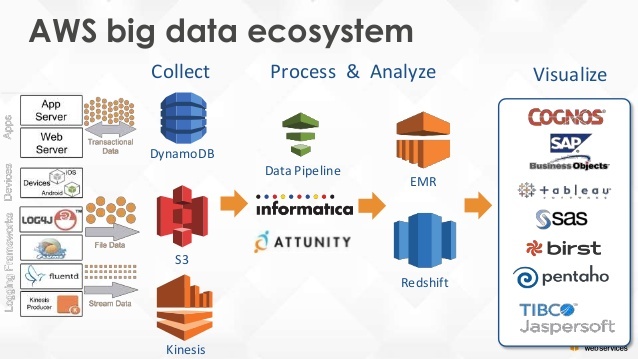 Big data on Amazon Web Services gives its customers or clients the widest array of analytics and machine learning services for easy access to all relevant data without compromising on security or governance. The introduction of new capabilities and features to the big data on Amazon Web Services is helping organizations in leveraging the latest technologies without making long-term investment commitments. With the data getting bigger, the Amazon Web Services (AWS) is positioning itself to help organizations leverage the deluge of information to create more business value at a lower cost. AWS is offering a library of free datasets having a commercial use for global enterprises and it is giving back to the developer and business community as a sponsor of Big Data University. Recently, a few months (November – 2018) back AWS announced the launch of ARM based servers for its EC2 cloud computing services and in addition it also introduced a new service for satellite providers with the launch of AWS Ground station which is the first fully managed ground station as a service. About NPV Staffing: NPV Staffing, Inc is a multinational, multicultural company that has been recognized as one of the top entrepreneurial companies by Entrepreneur. Specializing in providing high quality talent resources in the high technology field such as big data, analytics and business intelligence for Fortune 1000 clients since 2009, now every organization can benefit from NPV’s expertise.